Now through til the end of December save $67.40 when you purchase 3 Chemical Peel treatments and a delicious box of Baritrix Protein bars for $399! Luckily hope and help are available with a clinical procedure known as a "chemical peel". This popular, effective therapy involves applying a peeling agent to remove the very uppermost layers of epidermis revealing fresher, more evenly hued facial skin. 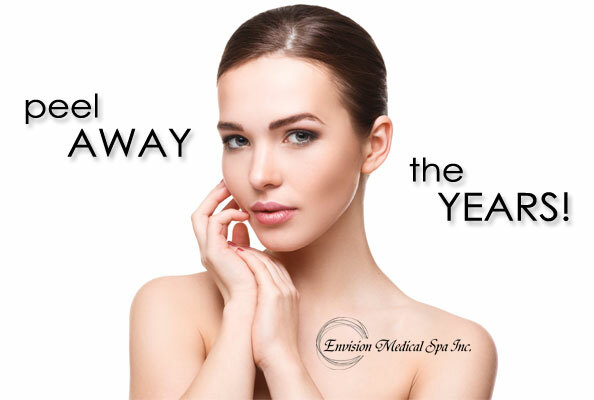 It's important to note wellness procedures which remove tissue should always be performed by well-trained, certified clinicians such as those at Envision Medical Spa in Leduc. This is no "home party" DIY activity. The clinician will begin by doing a complete facial scrub to remove dirt and other impurities. Then one or more peeling agents will be carefully applied to your face to peel away the dead skin and foster the growth of new layers of healthy, smoother, blemish-reduced skin. Depending on the condition being treated, a peel may need to be repeated a number of times for optimal results or fewer, but deeper peels may be appropriate in specific situations.